Selling a call against the initial married put, which effectively creates a collar, is the first income method discussed in The Blueprint and is shown for free in The Sketch. This is the first income method Kurt applied to the RadioActive Trade, and the most obvious one for those familiar with options. It is just simple: Buy Stock. Protect it with a Put. 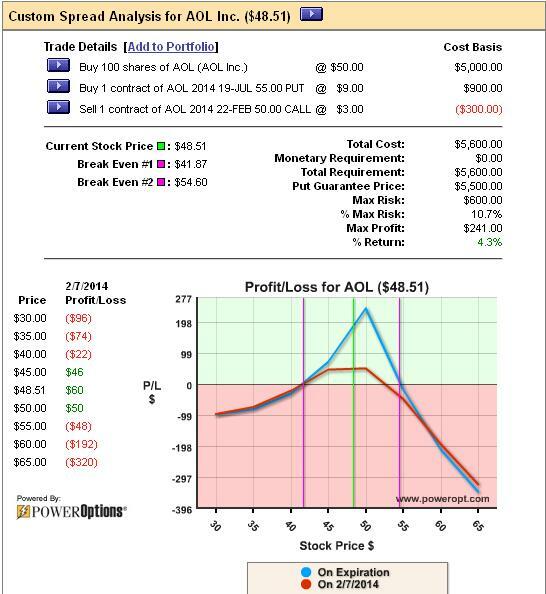 Sell a call to generate premium and reduce the at risk amount. What could go wrong…? Anytime I open a RadioActive Trade stock is purchased as well as a protective put based on the rules in The Blueprint. When I open a RadioActive Trade it is with the expectation that the stock will gain 5-8% in the next 20-50 days. I am not always right…which is why I am using a put option. Insuring the position does increase my total cost over just buying the stock. I have to keep my total cost basis in mind when looking to apply any income method – correctly or incorrectly. This RPM has a total cost basis of $59.00 per share. I am risking $4.00 of the $59.00 invested into the position. Why didn’t I sell a call right away when this position was opened? On the surface this does not look like a bad trade. The maximum profit is 4.3% – if the stock happens to be trading right at $50.00 per share on FEB expiration. But remember, if I had opened this RPM it was with the expectation that the stock would increase 5-8% in the next 30 days. And the maximum risk was lowered to only…what, wait!?!? The maximum risk increased to $600.00, or 10.7%! How is that possible? It is because of the structure of the trade. Because we sold the call below the put strike price, and well below our cost basis, the risk is now to the Upside, in the direction we thought the stock would move. 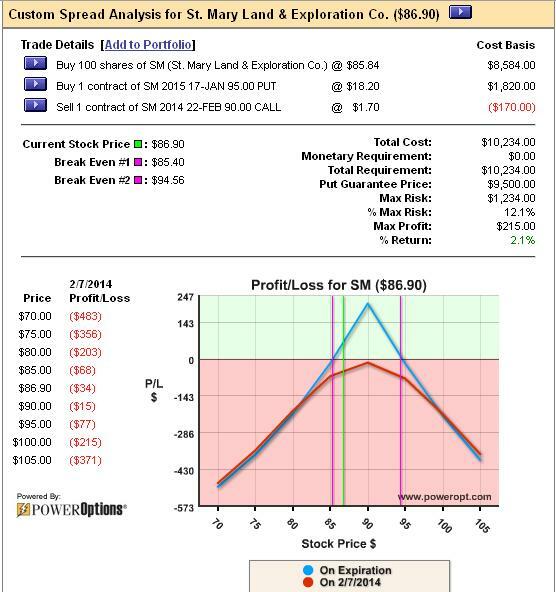 After selling the short call we have a total investment of $56.00. We sold the FEB 50 call, which means we are obligated to deliver shares of stock $50.00. If the stock gaps up, or runs away from us, what happens? The put looses value as the stock increases. The short call caps the upside potential we had in the stock. The lost value in the put is no longer countered by the gain in the stock, as the gain in the stock is capped. If the stock rises significantly, the put gets closer to $0.00. We get assigned at $50.00 on an investment of $56.00 per share. 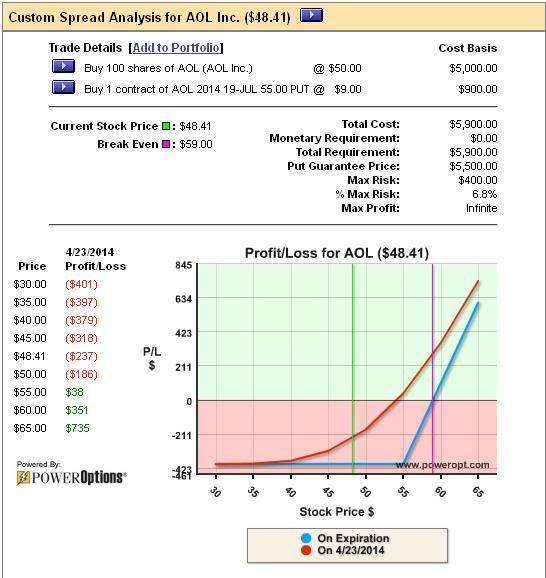 There is our new $6.00 at risk, or 10.7% loss if the stock goes in the direction we initially anticipated. Did we decrease the risk on the downside to only $1.00? Yes, if the stock fell to $1.00 per share the call would be worthless and we could exercise our put and receive $55.00 for the stock. This would be a loss of only -$1.00 to the downside. However, we entered the position with a bullish expectation and have now turned it into a bearish position. Cap the maximum gains, typically at a max. return that is much lower than your original expectation for the stock (thus, trading against yourself). Increase the maximum risk to the upside of the position, the direction you thought the stock was going to go. Change a Bullish position to a Bearish position – in this example I would be looking for the stock to be trading just at or below $50.00 per share, not to move up in price as I initially expected. Be Timing your Trades, not Trading Time. One of Kurt’s axioms for successful RadioActive Traders is: ‘Don’t time your trades, trade time’. In this example I am invested in a position where I want the stock to stay right where it is ($50.00 at open) for the first 30 days, then to move up in price by 5-8% or higher in the following 30-90 days. If you can consistently pick stocks that stagnate in price for the first 30 days then move up in price for the following month or two, this setup might work for you. Again, the downside risk was reduced by $1.70 when we sold the short call. However, we increased our risk to the upside due to the obligation of the call that was sold below the put strike price. Also, the maximum profit is now only 2.1%…if the stock happens to be trading right at $90.00 / share on FEB expiration. The RadioActive Trading techniques are about limiting risk and using the income methods to further reduce that risk while potentially increasing profits beyond the initial expectations for the stock. Selling a call below the put strike price counters those concepts as we will typically limit our profits below our initial expectations and increase the risk to the upside of the position. What if the goal is income and the expectation is for the stock to rise up to the put strike, could this strategy be used with the idea of using income method 2 if the stock price rises above the call strike price before expiration. I haven’t tested this idea but it sounds like it might work as long as the income method 2 strike price call is at or above the put strike. In other words we are happy if the call from income method 1 expires worthless but we will accept assignment at the strike price of income method 2 should the stock take off in price.